After a critically acclaimed debut album in 2009 The Pains Of Being Pure At Heart have finally released their highly anticipated followup. In Belong the shoegaze quintet from New York deliver another collection of discordant sounds paired with dreamy vocals that permeate the romantic heart. It’s all of what I find about shoegaze so appealing – the bitter-sweet. 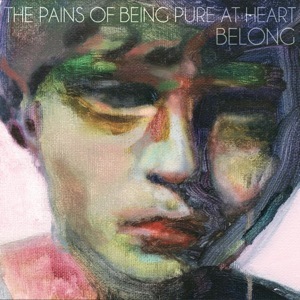 The contradiction of harsh noise kissed by the sweetness of airy vocals; The Pains Of Being Pure At Heart blends the two brilliantly in Belong. Of the 10-track album “Heart In Your Heartbreak” released as their first single in December stands out as the catchiest with “My Terrible Friend” a close second. The ballad “Anne With An E” is a tribute to a soul’s tortured past: “I don’t feel alright when disaster’s gone.” The final track, “Strange”, oddly parallels “Higher Than The Stars”, a song released on their late ’09 EP of the same title. The melody pairs so well it is almost as ifÂ “Strange” was written as a sequel to its predecessor. By the fourth track in, I was completely sucker-punched by The Pains Of Being Pure At Heart’s sophomore effort. In comparison to their debut, Belong is a touch less pop yet a pinch more mature and oozes of danc-ey, feel-good-ey, heartache-y pangs we romantics love so much. It tugs at the heart while leaving everlasting feel-good residual side effects.